Weirdly, corn mazes (as opposed to corn maizes, which would just be a redundancy) are a thing to do for fun in the fall. People actually want to play human Pac-Man through dying fields when it's cold because... actually, who knows. They should just start watching football. Regardless, visitors to the world’s largest corn maze in Dixon, CA have been acting like they're on level 255 of the arcade game, resorting to 911 calls when they can't get out because... again, who knows what these people are thinking. It's not like they're really being chased by Inky, Blinky, and Clyde. The company that handles the attraction, Cool Patch Pumpkins, issues maps to customers to help them on their escape from the 63-acre labyrinth -- and specifically advises against dialing 911. Typically, it takes about four hours to get out, but that hasn’t stopped panicky idiots from dialing 911. Authorities have found the calls humorous, though, and not really a nuisance. 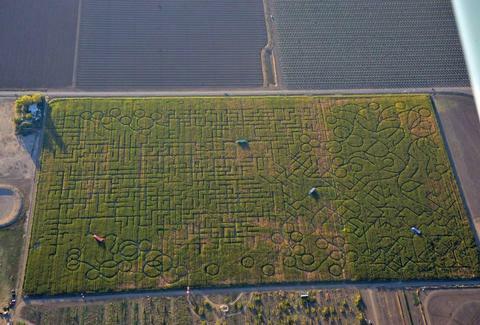 Solano County sheriff's Deputy Daryl Snedeker told SFGate the police usually calm visitors down, and contact the maze owners instead of dispatching a deputy. And the owners usually just talk people through the ordeal. The maze, which started out at 40 acres in 2007, has grown every year. But the owners have said next year they’ll probably “scale it back a little”. Or maybe they could just start offering energizers and fruits.